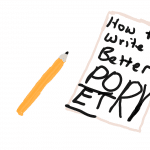 Are you looking for tips on how to read poetry out loud? You’ve come to the right place. Reciting poetry is an exciting yet difficult experience we all have to go through one time or another. Whether it is for your own writing process, for fun, a competition, or even a school project, reading out loud can be nerve-wracking. However, I find that the easiest way to deal with nerves is to follow these simple steps. The first step you need to do is analyze the poem. No, you don’t need to go too in depth, but be sure to check for various poetic elements. Look at the rhythm. Is it written in meter? Are there additional cadences? Is the meter constant? These are important factors to look at to know how to recite the poem properly. If the poem is written in free verse, be sure to speed up and slow down naturally, as if you were speaking to a friend. Is the poem written as sentences? If so, be sure to also use sentence intonation. Let the questions become questions, exclamations become exclamations, and declarations become declarations. Use emotion. Is the author depressed, furious, or joyful? Show it in your speech and actions. Your emotion will help dictate your listener’s emotions. Read the poem out loud several times. Get a feel for it. Feel the rhythm and elements as they glide off your tongue. Practice until it’s natural. Add exaggeration. Presentation often needs exaggeration. Exaggerate metered poems with the words and syllables being stressed twice as much as they normally would be in the speech. If this is tough to imagine, think about Shakespeare’s “to be or not to be, that is the question.” If you have ever seen this play in person, you will notice how actors exaggerate the stressed syllables almost excessively.In non-metered poetry, the poem also needs to be exaggerated when it comes to speed. The slow should be slower than normal and the fast a bit faster than normal. Use actions! Use your hands, your knees, your feet, your face, your whole body! Using actions make your recitation more exciting and energetic for the audience. Relax. Take a deep breath through your nose, hold it, then release it slowly through your mouth. Doing these simple steps have helped me through some anxiety-ridden classes throughout my high school and college years, so I hope this steps will help at least one other person to read a poem out loud in a confident, clear voice!